Buoyed by the reception of Galaxy M10 and Galaxy M20 smartphones in India, Samsung is preparing to launch another M-series smartphone, Galaxy M30. The design language of the new Galaxy M30 is expected to be similar to the both Galaxy M10 and Galaxy M20 smartphones but there surely will be few new features and a higher price tag. 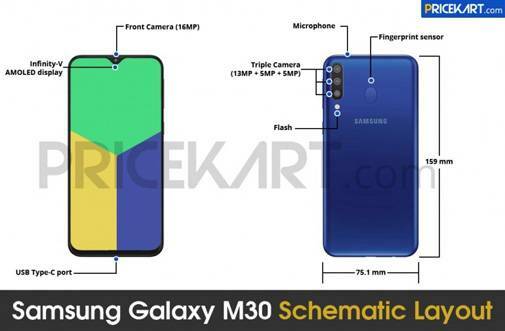 A schematic diagram of the new Galaxy M30 has propped up online revealing what some of these new features might be. The new Samsung Galaxy M30 diagram leaked by the Pricekart.com shows an Infinity-V display like the M20 and M10. However, there are very good chances that the Samsung M30 would get an AMOLED screen rather than the TFT screens that were seen on Galaxy M10 and Galaxy M20. The Samsung M30 is expected to come with a full-HD + screen measuring 6.38 inches with a screen resolution of 2210 x 1080 pixels. The leak also suggests a water drop notch for the Galaxy M30. A small bezel is visible at the bottom of the phone which could house navigation buttons. 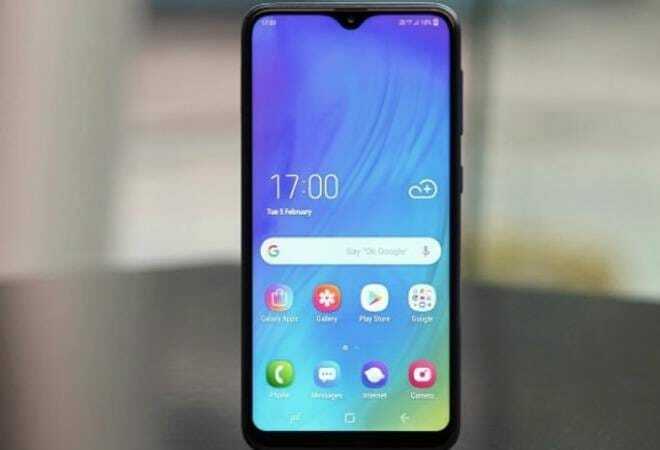 As far as the optics of the Samsung Galaxy M30 is concerned, the smartphone is expected to come with a 16 megapixel selfie camera. At the back, the Galaxy M30 is rumoured to come with a triple camera system, as per the drawings. Galaxy M30 can be seen with a vertical camera layout with the configuration as 13 megapixels + 5 megapixels + 5 megapixels. The rumours also suggest that the camera will have an ultra wide-angle lens together with a telephoto lens. The Samsung Galaxy M30 won't have an in-display fingerprint sensor. As per the design leak, the fingerprint sensor is located at the back. There is a USB Type-C port but there is no mention of 3.5mm audio jack. The Samsung Galaxy M30 will be powered by a 5000mAh battery and it would run on Samsung Experience 9.5 UX. As far as connectivity is concerned, the smartphone connectivity options include Bluetooth, 4G VoLTE, dual-SIM, GPS, GLONASS etc.